You set a clear goal. You’re excited about it. You’re ready to get to work. And then a few weeks later you fizzle. Your excitement wanes. You’re frustrated when you don’t see the results you want. It’s not that your passion for the project has disappeared. It’s still there, stronger than ever. It’s just that all the work you’re putting in doesn’t seem to be producing any meaningful results. And you can’t understand why. When it comes to achieving goals and dreams, far too many people doom themselves from the start. They set off on their journey to reach their goals without the critical thing they need to get where they want to go. To make sure you don’t repeat that same mistake, make sure you incorporate the essential ingredient that’s needed to reach your destination. I was cured of any desire for gambling when I was in college. One summer while on an internship in New York, I went on an overnight bus trip with my cousin and her friends to Atlantic City. I brought $40 dollars with me and lost it all within the first thirty minutes of being in the casino. Let’s just say it was a long night waiting to get back on the bus. I knew if I could lose $40 that quickly, and not have anything to show for it, there was no need for me to go and get more money to keep playing. While there are some people who may be able to come out ahead when gambling, my tolerance for risk wasn’t high enough to see if that could be my story. I didn’t know what I was doing. I didn’t know how to increase my chances of winning. My strategy was basically showing up and hoping that I’d win. It’s easy to see why it didn’t work. That’s unfortunately what many people do with their goals. They think that making the decision to play means they will win. But the decision to move forward is only the first step in the journey to success. After you decide to get in the game, you’ve got to devise a plan for how you will win. It’s not just about having a strategy. You need to have the right strategy. People often understand they need a plan. But just the act of writing one down doesn’t make it good. It doesn’t mean that it is the right approach to get you the results you want. In fact, bad strategy is prevalent. It appears in businesses large and small, non-profits, and organizations of all shapes and sizes. And it does as much harm as not having one at all. In other words, a bad strategy will do the opposite of what you’re hoping it will. A bad strategy will fail no matter how good your execution is. Not having a strategy is no good. And having a bad strategy is no good. So let’s get you started on the path to creating a good strategy that works for both you and your business. 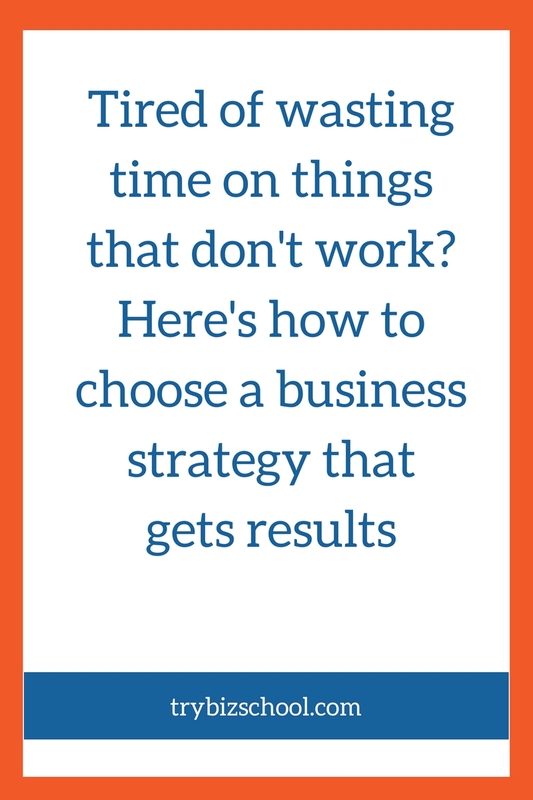 Determining your strategy isn’t a one-size-fits-all thing. It’s not like going to the mall and picking something off the shelf to wear. You’ve got to invest time to find the approach that works best for your specific situation. One that’s tailor-made for you. So herein lies an important question: How do you choose a business strategy to help you reach your goals? Here are six things to consider to help you figure it out. The purpose of a strategy is to get you from point A to point B. But if you don’t know what the problem is you are trying to solve, or where it is you want to go, you will have difficulty building a plan. This also means having a good view of your overall circumstances, both those that are under your control and those that are not, that have an impact on your ability to solve the problem. As a result, you’ll be able to build a plan that directly helps you solve your problem even with all the external forces. For instance, when I’m not in Buenos Aires, I live in Florida. And I really enjoy biking as a way to stay in shape. But this becomes extra difficult during Florida summers for two reasons. The first is that it is extremely hot for much of the day. So my window of being able to go outside for a ride while it’s light out and without the stifling heat is limited to a short time in the mornings and evenings. The second issue is that it rains almost every day. A rain shower may last for only forty-five minutes, but if it happens during one of those short windows, or if it leaves lots of standing water on my bike trails, then getting my ride in becomes more difficult. So I need to define my problem, as designing a workout plan that incorporates cycling no matter what the weather is outside. Knowing both what problem I’m trying to solve, and the conditions in which I need to be able to solve it puts me in a much better position to create an effective strategy. You’ve got to do your research to know what plans exist in the realm of possibilities to help you get to your goal. Being informed about your available choices, what their track records have been in the past, and what’s required is essential. As you go about researching them, it is helpful to make a list of the pros and cons for each. As you go about exploring your options, you may realize that none of them work for you. That’s ok. There’s nothing wrong with charting your own path. It is just helpful to know what’s out there first, so you can make an informed decision about why you are taking a different route. Being clear about what is most important will help be a tremendous help in evaluating what strategy is right for you. For instance, in this interview, I chatted with Kemi Egan, co-founder of Freedom Academies. After the economy crashed in 2008, her healthcare business was gone, and she found herself homeless and hundreds of thousands of dollars in debt. One of the big things I did was look at what I needed. So you’ll see in a lot of these roadmaps, ‘How to create a $10 million dollar business in the next three years,’ or “How to make lumps of money flipping properties in only nine months.” And all of those were brilliant, but what I needed was cash flow. I needed it, and I needed it yesterday. So anything that was going to take nine years, two months, whatever it just couldn’t happen. It had to be virtually immediate. So that’s how I narrowed it down first. It was cash flow and it was quick. And then it was ‘I don’t have the money,’ so it had to be a strategy that was going to bring in other people’s cash or bring in other people’s resources. So I really had to nail down what strategies would allow me to do that. Having a prioritized list of what is most important to you will save you a ton of time and energy by helping you view each strategy through the lens of your short and long-term goals. Every approach you consider to reach your objectives will require resources. And before you can begin to effectively evaluate if the strategy will be a good fit for you, you’ve first got to know if you have what you need to execute the strategy appropriately. If you have all these resources available to you, then it makes sense to continue exploring this strategy. But if you don’t, you’ll have to do a bit of due diligence to figure out if you will be able to source what you need. Think of a strategy like an iceberg. It can be easy to evaluate whether or not it might be right for you based upon what you see on the surface. But what lies beneath could spell disaster if you’re not prepared for it. So when it comes to evaluating strategies, you’ve got to do a deep dive to understand what it takes to make it work. In the previous example, we listed some basic resources you would need to produce a podcast. While these materials will help you get a good sounding show published, there’s a whole slew of other things that you need to do to make your podcast successful. Do you see how these are two different things? For a successful show, you’ve got to build up an audience of listeners, which means you need to find a way to reach them. Perhaps that’s by amassing ratings and reviews in iTunes. And because listeners come and go over time, you also need to have a system that continues to generate new listeners for you. All of that is separate from the time it takes to ensure the content of your show is top notch. When you have a clear view of everything that is necessary to be successful with your strategy, you can make a more informed choice about whether or not it is a path you are willing to take. This one is super important. Because you can come across a strategy that seems like a great fit for you, but if it requires you to do a number of things that don’t play to your strengths, then that could be a red flag. Let’s say, as you evaluate your options, you decide that going to networking events is a viable strategy for you. Then as you explored everything that would be required to be successful with this approach, you realized just how much talking with strangers you’d have to do. If the thought of leaving your house and talking with people you don’t know over and over again gives you an anxiety attack, then that’s a good sign this isn’t an ideal strategy for you. It’s a fantastic thing to step outside your comfort zone. It’s just not necessarily the best idea when your entire strategy depends upon you repeatedly engaging in a task that makes you uncomfortable. No more gambling with your time and energy. No more investing valuable time and resources on a bad strategy. It’s time for you to get focused and get the results you want for your business. But to do that, you need the right plan. So set some time aside, and work through the considerations above to help you find the one. You’ll be well rewarded for the effort. Great post here. You’re absolutely right about all strategy not being good .. or the right strategy. I went through that a while back and although it only cost me time, I was still upset about it. It only solidifies the importance of having a strategy that works for you. Love the 6 points you made and I agree about the importance of the stumbling block point. If it doesn’t play to your strengths (so to speak) know quickly to move on from it. I think we all need a plan of action. if not then you can just bumble along unhappily with no results. I have an accountability partner, this has helped me stay motivated with my current projects. I think everyone hits a block, starting to doubt their current path. If we don’t get results straight away then we can lose interest. But , if it was easy then everyone would do it. My pleasure Nathan! An accountability partner certainly goes a long way in helping with motivation and just getting things done. Glad to hear you are on the right track, and pushing through the difficult times on your journey to success.